Samsung In-ear Headset / Handsfree / Earphone HS130 is a 100% Original Samsung Product. It is compatible with any smart Phone. The earphones are compact and comprises of light-weight design. It comes with the In-Line Multi-Function Remote with Built-In Mic Performs Answer/Send, Volume Control and Track The HS1303 built-in control with ergonomic button design gives your greater control over features such as Mic, Play, Stop and Volume. Samsung In-ear Headset / Handsfree / Earphone HS130 is a 100% Original Samsung Product. It is compatible with any smart Phone. 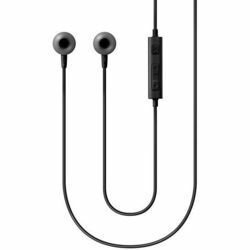 The earphones are compact and comprises of light-weight design. It comes with the In-Line Multi-Function Remote with Built-In Mic Performs Answer/Send, Volume Control and Track The HS1303 built-in control with ergonomic button design gives your greater control over features such as Mic, Play, Stop and Volume.